I travelled by camel on a 28-day journey with one camel and a guide departing and returning to Fada. The trip started on 8th December 2011, and finished on 4 January 2012. The journey was excellent, the guide very good (although he could not speak any French or English, and I could not speak Goorani). 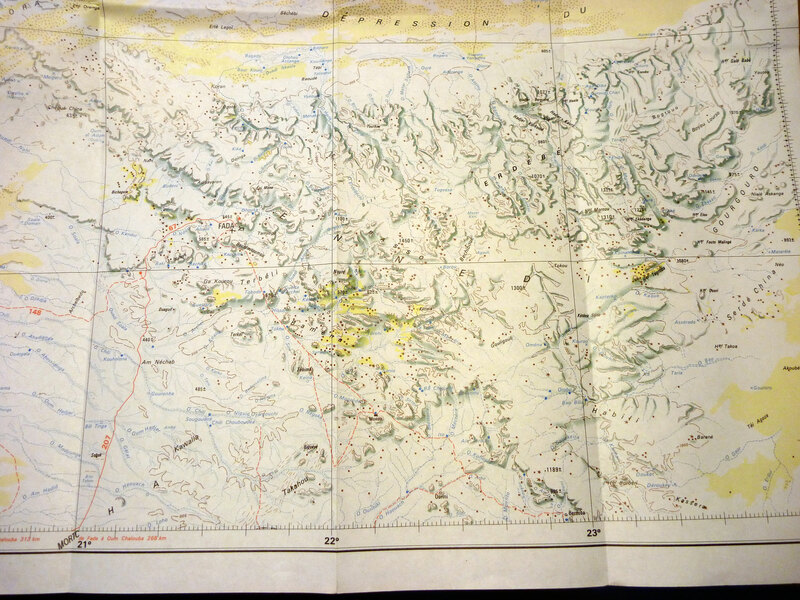 The trip covered several of the Ennedi highlights, including Guelta Archei (3 nights), Puit de Tokou (2 nights), Guelta Bachekele (noted as ‘Ba Chekele’ on the 1974 IGN 1:1m NE34‘ Largeau’ sheet – top left, click to enlarge), 4 nights, Monou, Rocks of Terkei (2 nights), Guelta Deli, Baki and then returning to Fada. We travelled about 5-6 hours a day but spent several days at some sites. The weather was excellent, with only 2-3 days of quite strong wind. Food for the trip was basic, based on variations of spaghetti, rice, sardines, dried tomatoes, onions and tinned peas. The trip was easier to organise than I had expected. I arrived in Fada on one day, discussed my reasons for coming to Fada with the Police, and they produced a guide for me. I suspect a relative of one of the Police. I organised a written contract, outlining a rough itinerary, stating the price, start and finish dates on my second day in Fada, and started the trip the third day. I was conscious for my own security that the Police should be aware of my travel plans, and the identity of my guide; this was all done before I departed. The region is quite spectacular, with huge vistas of the desert with great rocks worn into all sorts of shapes, along with cliffs, arches, overhangs, ‘organ pipe’ stands of rock, and it was also enriching to see and meet the people who make their lives in this harsh environment. There were rock paintings to be found in caves – it was good to be able to have time to ‘discover’ my own as well as those known to the guide. There were many camels, all looking in very fine condition as well as goats and sheep. 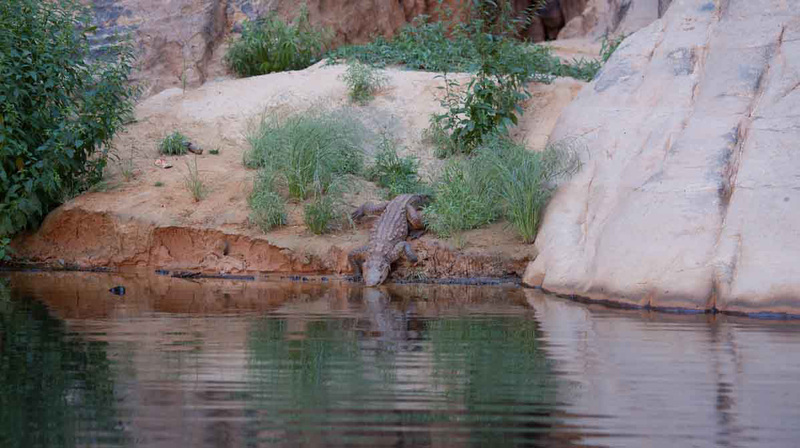 There was some wildlife to be seen – Dorcas Gazelle, crocodile (Guelta Archei -I had most success seeing the crocodiles early in the morning before the camels arrived), Hyrax, Fennec Fox, Jackal and Barbary Sheep (mouflon) at Guelta Deli. I am sure they were Barbary Sheep, but I need to do some research when I return home. Owls often called from the cliffs at night. I had a great time, and we returned on the 4th January to Fada, as agreed. I took with me the inadequate very short chapter on Chad from Lonely Planet, as well as the very informative ‘Petit Fute Guide to Tchad 2011-2012’ 3rd Edition (2010). This 240 page guide has lots of information about things to see and do in Chad, as well as accommodation and GPS waypoints, but assumes that you have your own vehicle, so is not very good for getting about using local transport. I travelled by bus from Ndjamena to Abeche (last internet). I then found a 4WD going north to Biltine, where I stopped overnight at the Restaurant Al Afia. (There is no accommodation in Biltine). I found other transport going to Kalait further north. (It is not marked on all maps, but is located a little further north than Oum Chalouba). There I stayed with the driver of the 4WD, as again there is no accommodation there. Transport to and from Fada is not available every day. I was lucky, and got a ride on an ancient Toyota Land Cruiser the next day. I arrived in Fada the following day. There is no accommodation in Fada, and was given the OK to stay in a Police cell at the Commissariat. Neither is there a restaurant in Fada so note that eating options here are limited. Cell telephone service is available in Fada and Faya. To leave Fada, I had to wait for three days before I found an empty supply truck returning to Kalait. I then travelled from Kalait to Faya on top of an ageing Mercedes truck with 40 others, and stayed in Faya for 4 nights. Again, there is no accommodation in Faya – the only Auberge mentioned in guide books – the Emi Koussi – has closed. I stayed with a family near the Place de Marche for 4 nights. The people of Chad were very helpful and accommodating. To return to Ndjamena, I went by 4WD which took 2 days, although can take longer. 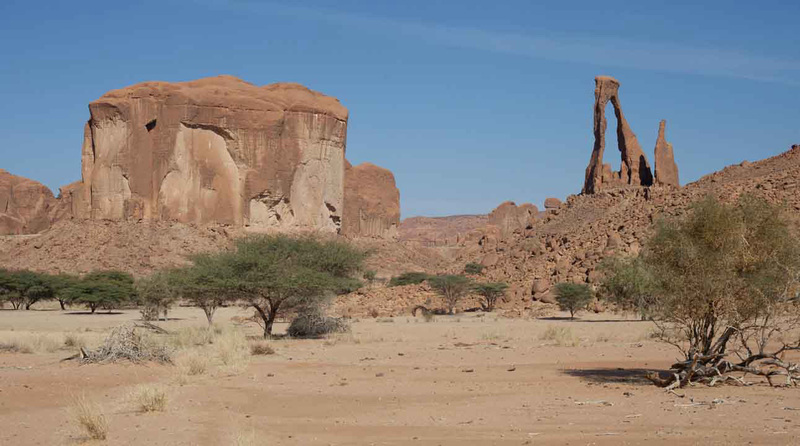 I had thought about visiting Tibesti, but decided to see Ennedi ‘properly’, and to see Tibesti on another trip. This is as well, because when in Faya 10-13th January it was very windy and very cold, making sightseeing very unpleasant to say the least. Costs. I paid CFA 10,000 or €15 per day (CFA655 = €1) for the camel, another CFA 10,000 per day for the guide, a lump sum of CFA150,000 (€235) for the basic food (sugar, spaghetti, sardines, tea, onions), and I spent another CFA 50,000 (€75) on ‘extra’ food, including tinned peas, biscuits, several kilos of dried milk, dried tomatoes and some extra sardines. (The options are very limited in Fada). 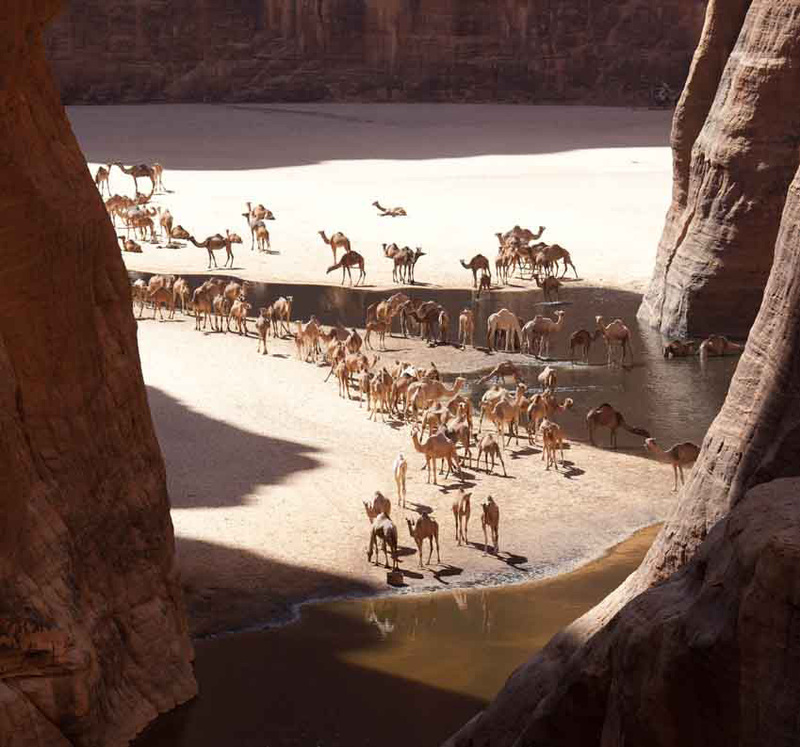 The sting in the costs was the Tourist Tax levied at both Guelta Archei AND Guelta Bachekele. It is charged ‘per group’ – so if you are a ‘group’ of one then you have the honour of paying the whole fee. The tax is CFA50,000 (€75) per group at Guelta Archei, and I paid CFA40,000 (€63) at Bachekele, although the Police advised that it was CFA50,000. We had one large camel, which I was free to ride, on a shared basis with the guide. Mostly I preferred to walk, because although a great baggage camel, it needed work to make sure it kept walking at a reasonable rate in the correct direction. You are also freer to take photographs while walking. 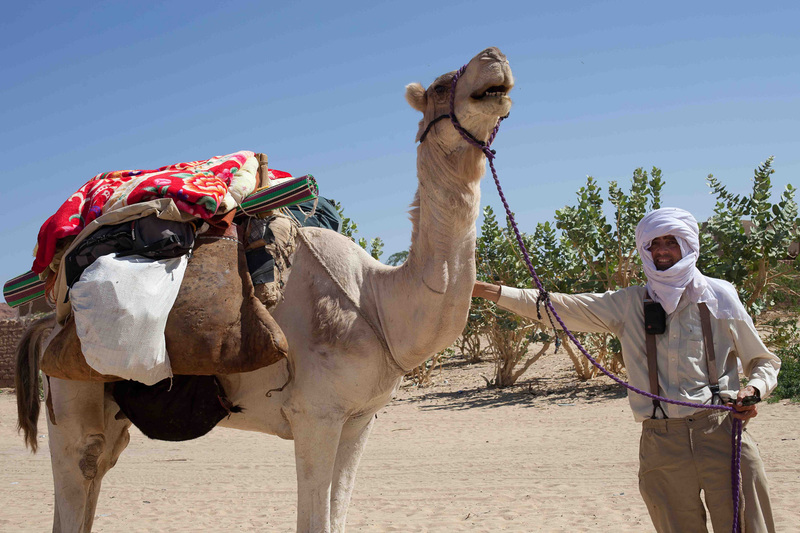 Take a warm sleeping bag, as some nights were quite cold – say around 5-8 degrees C. My guide Karli Kallia – known by the Police as a camel guide, was excellent. This entry was posted in Uncategorized and tagged Abéché, Camelling in Chad, Camelling in ennedi, Chad, Ennedi, Fada, Faya, guelta archei on October 3, 2015 by Chris S.